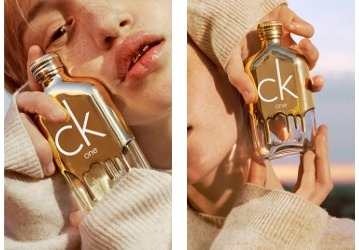 Calvin Klein will launch CK One Gold, a new limited edition flanker to 1994's CK One, in August. ck one gold is a tribute to the youth who can do no wrong. everything they touch turns to gold. unconstrained by traditional gender norms, ck one gold fuses the energy of both sexes in one unisex fragrance. a singularly captivating scent that promises a drop of gold for everyone. a limited edition eau de toilette, the scent is a juicy, fresh, woody smell that captures the golden allure of radiant youth. the juicy top note of fig creates instant fascination with its energetic freshness. the bright heart of neroli is the sparkling crown that shines like the last rays of the setting sun on a city. the sun-drenched base of vetiver gives depth, leaving a vibrant, sensual warmth on the skin. Additional notes include bergamot, sage, violet, jasmine, guaiac wood and patchouli. Calvin Klein CK One Gold will be available in 50, 100 and 200 ml Eau de Toilette. Sure, why not? Unless Silver, Bronze and Platinum are to follow suit. That should be the next Prix Eau Faux — write the ad copy for CK One Tin. I sure do like that bottle, though. Beautifully done. I couldn’t see past the model’s gold teeth. Terrible images and official description. lol I missed the gold ‘grill’ on the model. I loved CK One when it first came out. I cannot imagine it with a fig note. Blech! Very 2000 and late, right? “grill” or retainer? The model looks about 10 yrs old. Don’t Forget cKOne Adimantium Edition… for those whose spirit is TRULY Unbreakable!